'I thought you are done with baking' said my husband sarcastically as he saw me baking my birthday cake. I told him that I'm not going to bake anymore last week (and maybe several weeks before too haha) as we want to clear out the ingredients before we leave Malaysia, but the idea of me not having a birthday cake baked by me is kind of sad when I have baked for others for their special days. We had a large pint of Greek yogurt thus I decided to make my favorite vegetarian cake with a twist - pandan flavor! I bought few pandan leaves couple of days ago and made pandan paste out of it. I combine it with my favorite vegetarian cake recipe and voila, delicious and moist vegetarian pandan cake. I decorated the cake with cream cheese frosting and made salted caramel cream cheese filling for between the layers. 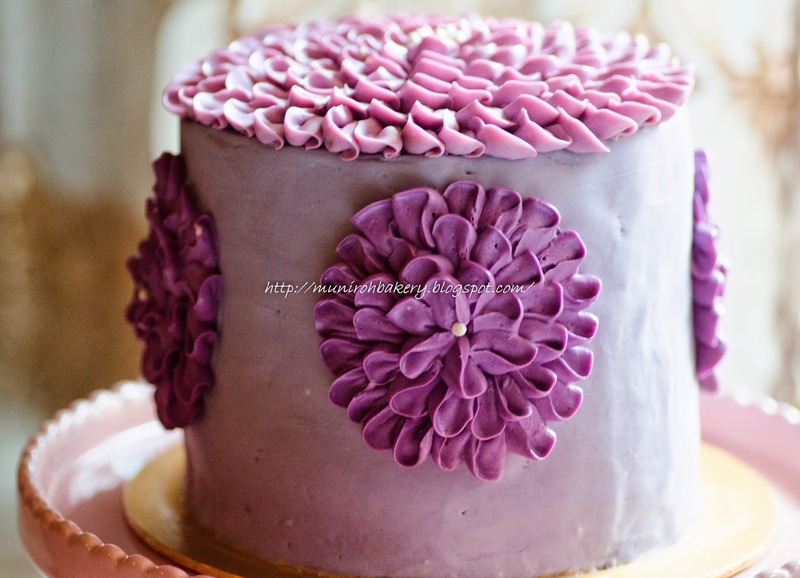 And yeah, I obviously had to decorate the cake purple - my favorite color! 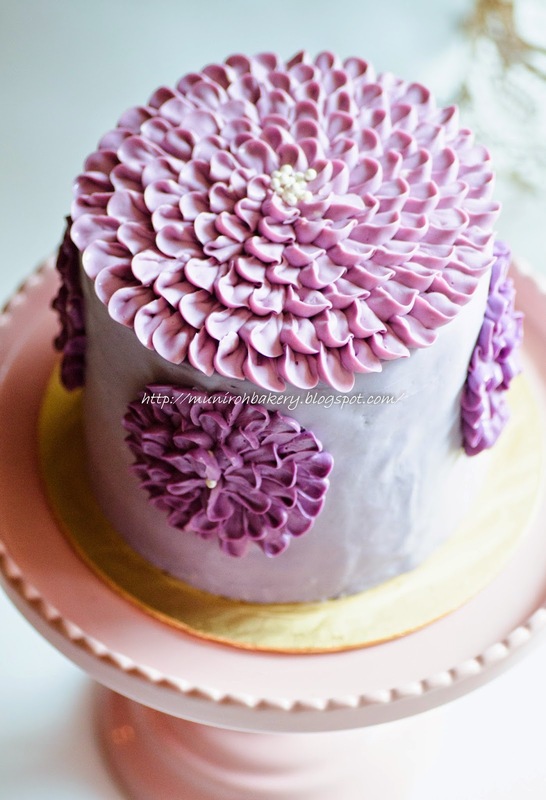 Side view of my birthday cake - 6' tall pandan cake with salted caramel cream cheese frosting decorated in purple ruffles. The taste was awesome! Just the way I like it - moist, not too sweet and refreshing pandan smell. I think I will miss baking this cake in Netherlands. The chance of finding fresh pandan leaves is slim, plus I don't like the idea of using the yucky and unnatural pandan flavoring. For those who are not familiar with pandan, I would say that it has nice and subtle fragrance of rose. It gives out light and refreshing taste, and tastes well when you complement it with palm sugar :) I think most (if not all) of the Southeast Asian countries use it in their cuisines. 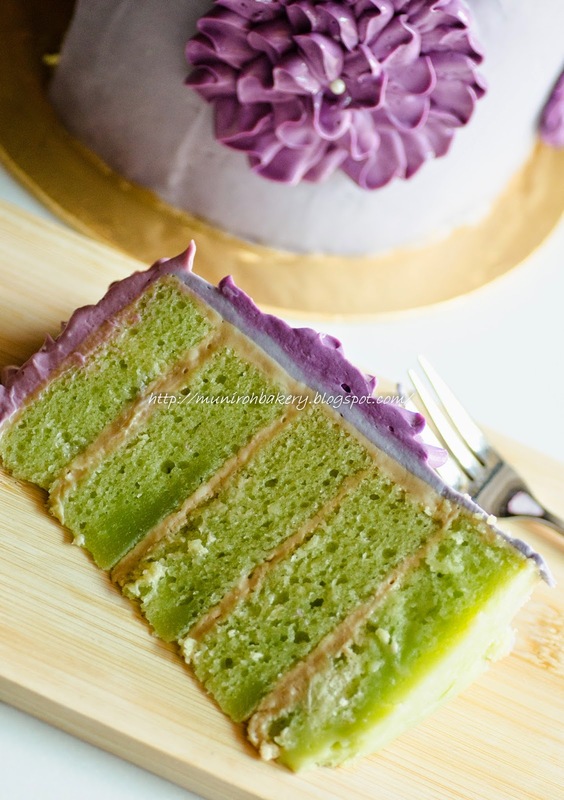 Natural green color of the pandan makes this cake looks so yummy!